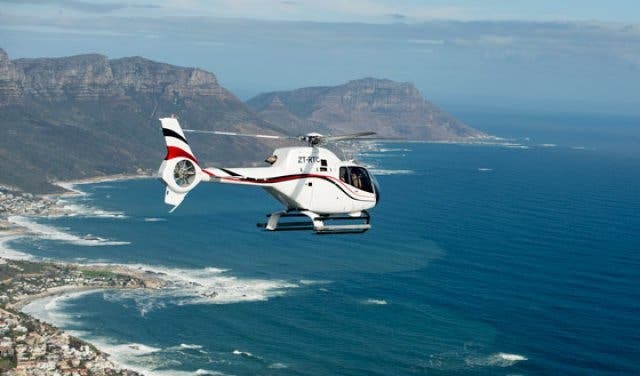 Epic is daily flights to 25 routes in the latest Airbus helicopters, with 270-degree views of Cape Town and experiences like clay pigeon shooting, a Harley Davidson ride or shark cage diving combos with your flight. The best part? It’s accessible: flights start from little more than the price of two dinners at a trendy Cape Town restaurant. 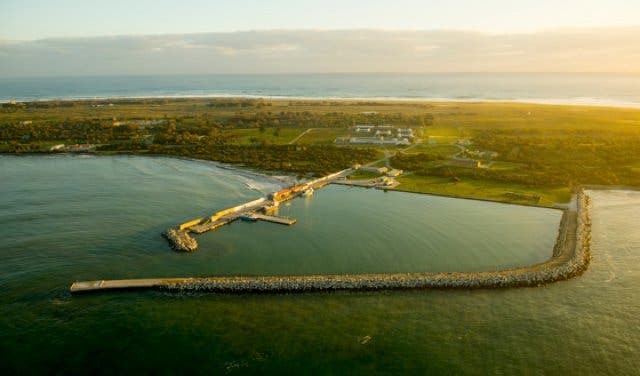 Even better, CapeTownMagazine.com readers get the Hopper flight for only R1260pp (that's a 10% discount) via this secret link. Or get a 10% discount on ALL other flights with Cape Town Helicopters. Claim yours by using our unique booking code: FlyAirbus. And countless others echo his views – tourists and locals alike. “It’s a must-do for anyone visiting Cape Town,” says Graham H from Cardigan in the UK. “Stunning views of Cape Town. Professional and friendly pilots. And great importance is given to safety,” comments Sunetra B of Singapore. “Had such a great experience seeing my city from this new perspective,” says Keith L, a Cape Town local. 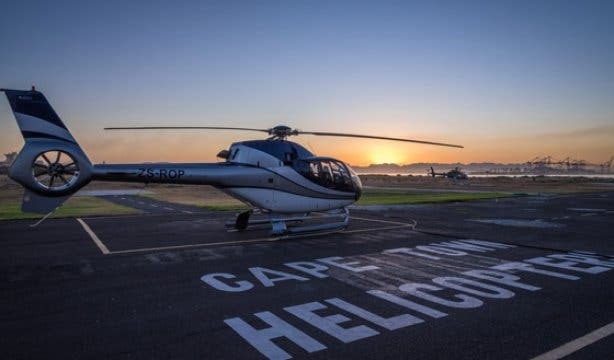 At the time of writing, close to a thousand people have given Cape Town Helicopters an “excellent” rating on TripAdvisor alone. So, it’s no wonder that on this platform a flight with them ranks second in the top three experiences and tours in the Mother City. And they’re voted the city’s number-one helicopter operator. Which is no easy feat, considering they share the V&A Waterfront helipad (the busiest helipad in Africa) with a number of other operators. So what sets Cape Town Helicopters apart? Cape Town Magazine went down to the V&A Helipad at 220 East Pier in Breakwater Edge to find out. * Get it for only R1260 via our exclusive this secret link. Plus, if you combine a Cape Town Helicopter flight with an Ocean Experience, you'll get 15% off. 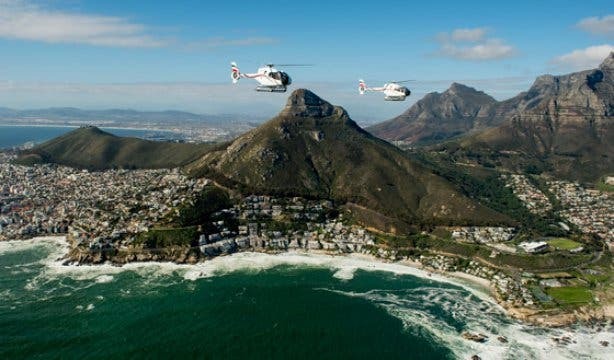 “We all love Cape Town,” says Cape Town Helicopters commercial manager Herman Geldenhuys, “and we want people to experience the city the way we see it.” That’s why, when the long-time pilot and aviation enthusiast Neil Warren took over operations here three years ago, he completely reimagined the Cape Town Helicopters experience, from the ground up. Neil brought in the latest new tech. Our Airbus H 120s and 130s are newer and costlier to buy and maintain than the Bell ones our competitors use, but they’re what the very top helicopter operators use worldwide, from Hawaii to Mauritius. They’re more stable in high-speed winds, safer because of their design and the use of more advanced technology and much quieter (for a more eco-friendly tourism experience) thanks to enclosed fenestron tail rotors. “Our helicopters are the only ones here that are legally allowed to fly into sensitive areas such as wildlife reserves. Which is why we also offer daily tours and safari flights to Sanbona Wildlife Reserve and Aquila Game Reserve, Herman adds. 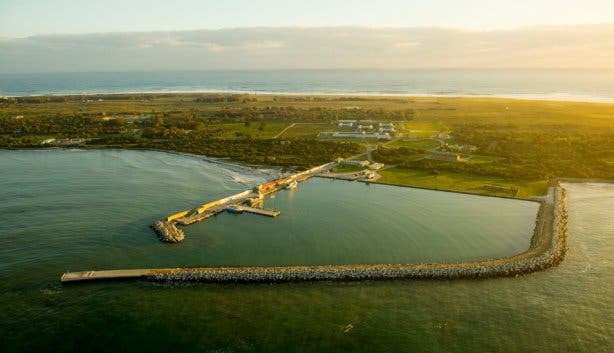 And, for incredible new perspectives of the bay and the city, consider booking one of their daily flyovers of Robben Island. And it’s true, Cape Town Helicopters’ crafts boast a 270-degree view of photogenic Cape Town from the air (much wider than the constrictive Bell chopper alternatives), which makes the world of difference when you’re recording video and photos to share your Instagrammable experience. What’s more, the new tech means your flight’s air-conditioned and allows for the use of soundproof headsets with voice-activated microphones that just add that little extra touch of comfort to the experience. “We soon started doing in-flight video recordings, too. Because we found that people were so taken with the views and the new perspective, that they get carried away with taking pictures and often forget to take the time to relax and just enjoy the experience. 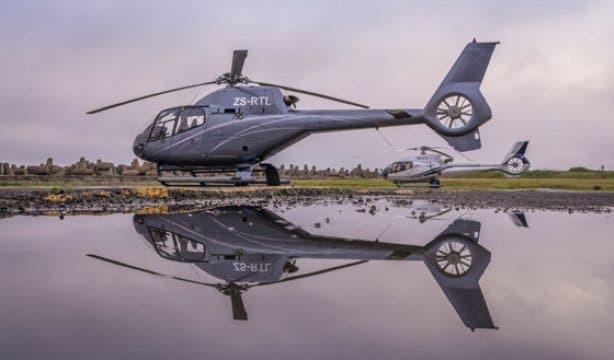 Now, we can record the flight on four HD cameras – two inside the cab, two outside – and give you a packaged video of your epic Cape Town Helicopters experience,” Herman adds. From this, it's clear that the secret to this operator’s success lies in their going the extra mile to ensure each passenger gets the absolute best from the experience. 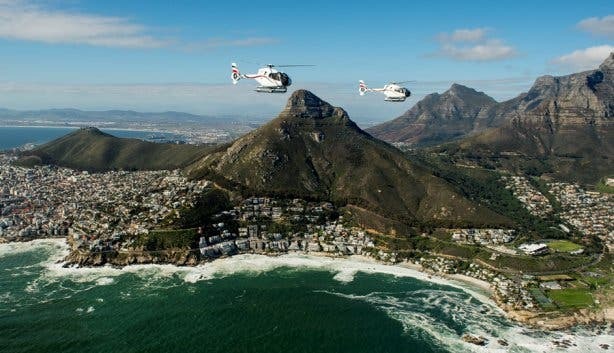 The Cape Town Helicopters experience starts long before you even board the craft. They offer a transport service from the malls and various districts of the V&A to the helipad if you phone ahead, so you don’t have to walk or drive to the pier. In fact, you can even have them pick you up straight from Cape Town International Airport, where you’ll do your awesome helicopter experience first and then land at the V&A, bypassing all of the city’s congestion and traffic. 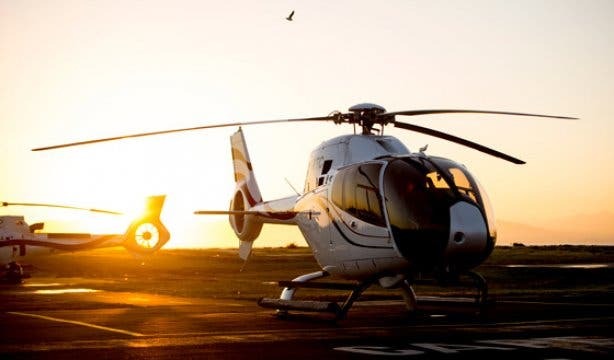 Or, do it the other way around and have your epic helicopter experience as a farewell to Cape Town before landing at the airport and being driven straight to the departures hall – recommended are the Full Peninsula or Two Oceans flights. And, of course, walk-in customers are welcome too. They do around 35–50 flights daily, taking off on over 25 different routes, ranging from scenic city and Atlantic Seaboard flights; Cape Point tours; golf tours to Hermanus, Langebaan or Paarl; flights up the West Coast or to a game reserve; to adventure tours that combine your flight with lunch and an afternoon of clay pigeon shooting, shark cage diving or a Harley Davidson motorcycle ride. Then there are also the very popular VIP Winelands lunch experiences. And the team is highly organised, able to schedule your flight with maximum precision and minimum waiting time. The ground crew are incredibly experienced, most having worked this same helipad for the last six years at least, so you’re in excellent hands there. And the reception and ground host staff are so good at their jobs that they often get their own mentions in customers’ online reviews. But the most notable part about the Cape Town Helicopters experience is their pilots. Cape Town Helicopters runs their own flight school, which allows them to choose only the best and brightest pilots. (Two of whom are women, and word around the helipad is that they have a lighter touch than the men, resulting in a remarkably smooth helicopter ride.) And, as a prerequisite, all pilots are also qualified tour guides, which means that you get so much more from your time in the air with them. You can get the full experience on Cape Town Helicopters' Atlantico and Hopper flights. About a minute later, you reach the 12 Apostles and now draw level with Table Mountain at around 3000 feet (close to 1000m). Cape Town Magazine was fortunate enough to experience the Cape Point tour, which, if you’re already a fan of the natural beauty that is Africa’s most south-westerly point, is an absolute must. The climax comes when your pilot flies you out, far beyond the lighthouses, over the ocean, and then curls the craft back so that you get that one-of-a-kind view of the point and the Cape of Good Hope from the air. But then you look at all of this and you think that this all sounds great but can I actually afford a helicopter flight? And here’s where things get really interesting. The short answer is yes. Considering that it’s an epic, perception-changing, once-in-a-lifetime bucket list kind of experience, you’ll be pleasantly surprised at the wide range of options on offer at Cape Town Helicopters and how inclusive this experience actually is. And he’s not kidding. 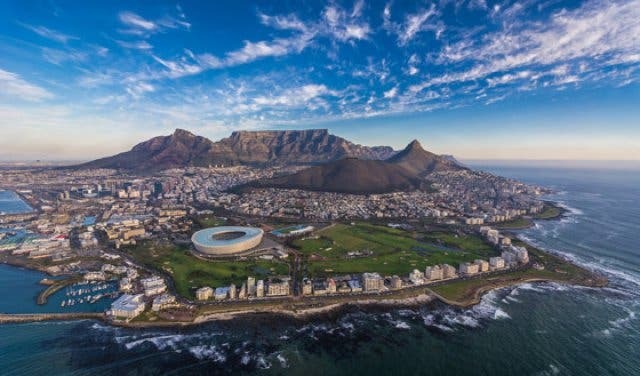 A glorious 15-minute “flip” on the Hopper flight across the skies of Cape Town (including shots of the mountain that’ll light up your Instagram like it’s New Year’s Eve) comes in at a very doable R1400 per person (R1260) if you use our secret link). Which, if you think about it, is little more than you’d spend on about two meals at a trendy restaurant or a night or two out with friends in any given month. Or, if a couple of friends get together and each pitch in between R100 and R250, you could buy a buddy the birthday gift they’ll treasure forever. Or a family could get grandma the experience of a lifetime. Beyond that, Cape Town Helicopters’ Atlantico flight, which takes you from the Waterfront down the city’s entire Atlantic Seaboard to Hout Bay, Chapman’s Peak and then back again for an awe-inspiring double-take from the other side, puts you back only R2000 per person. Which, again, if it’s your 10th anniversary or you’re looking to propose, is awesome, all things considered. And, speaking of proposals, Cape Town Helicopters do about 26+ “engagement flights” each year. They know how to handle this kind of thing by now – there’s a fair bit of collusion beforehand, where they’ll ensure you get a private flight and the pilot will signal the absolute perfect time for you to pop the question mid-air (with the perfect backdrop for the best pics and video, of course). What’s more, they have a 100% “yes” ratio, so, take note, this is where you go to turn up the romance. The adventure experience flights, such as the clay pigeon tour where you fly up the False Bay coast to the Lourensford Estate on the Helderberg Wine Route and do 25 shots with four different shotguns, is popular for special occasions and big birthdays (30, 40 and 50 etc.). While the VIP lunch experiences and safari flights are ideal for corporates and exceptional business meetings. In summation, Cape Town Helicopters offers one of the most epic, perspective-changing ways to experience the Mother City. And they do so in an inclusive range offering that makes it accessible to everyone, from tourists to locals, businesses to individuals. 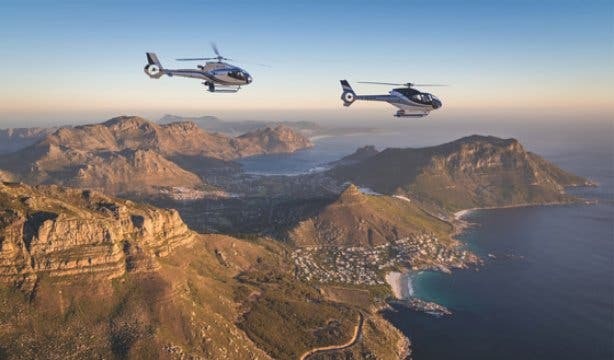 Which, on its own, is already more than enough reason to make a helicopter flight part of your ultimate Cape Town experience. Want Cape Town water adventures everyone can join in on? Check out these ultimate ocean experiences to tick off your bucket list. We also have a comprehensive look at top day tours as well as team building and end-of-year function ideas. In terms of gifts, check out our guide to Mother’s Day in the city. And, if it’s the romantic experiences you’re after, see our ideas for Valentine’s Day offers and things to do on 14 February.